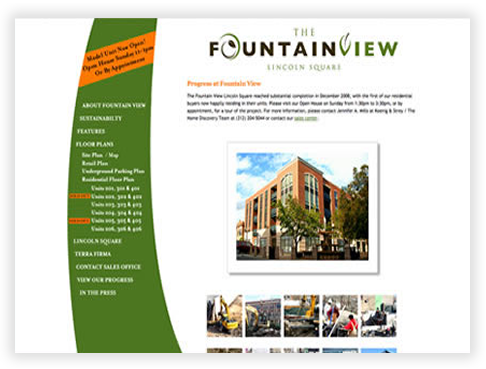 FountainView was designed by a Chicago based design firm and Swartwerk Media Design built the website to the design specifications. This website was hand-coded using CSS layout and was backward and forward compatible and web standards compliant. 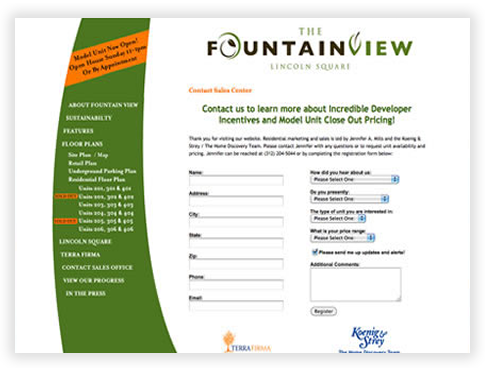 The FountainView webiste was very successful at showcasing the FountainView and generating many leads and played a vital role of the marketing mix. The home page went through many variations as the FountainView progressed. 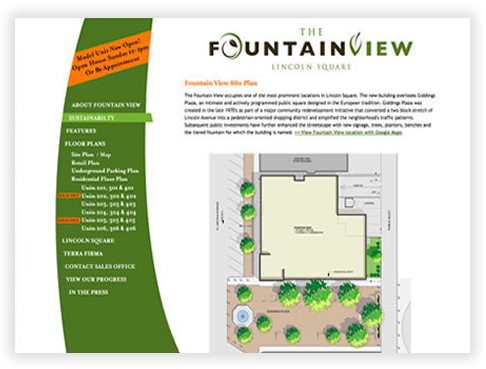 The website launched with a single static architectural rendering of the FountainView in Lincoln Square. As progress continued on the project the main image became a dynamic fade and dissolve slideshow. Once construction was complete Swartwerk Medias Design shot interior and exterior photography for the final slideshow. 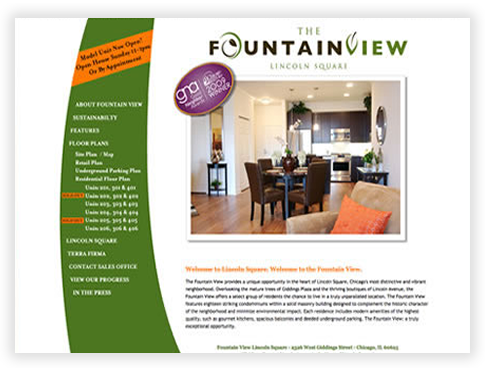 In 2009 the FountainView was awarded with The Chicago Association of REALTORS® Good Neighbor Award. This badge was then overlaid upon the slideshow's upper left corner. This page provided the viewer with the architect's master rendering of the site plan and description of the site and surrounding area. 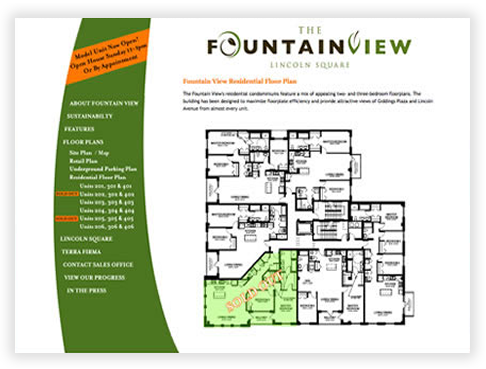 The FountainView website has a variety of pages with floor plans. This page displays the main floor plan and each unit plan highlights as you roll over it, if that unit is sold out, it will display stylized "SOLD OUT" text. Once you hover over a unit plan it becomes a link to that building unit's detail page. Each unit type has a corresponding detail page that provides a floor unit floor plan, a description and specifications for that unit, such as number of bedrooms, number of bathrooms and square footage. 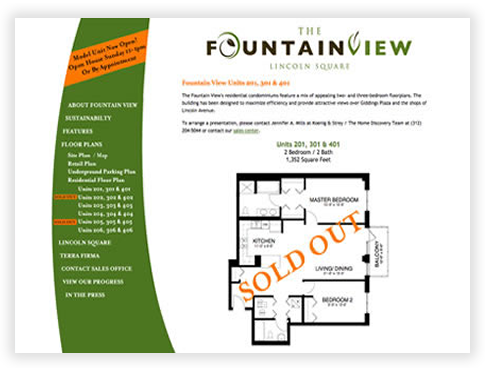 Prospective buyers were eager to watch the progress of the FountainView as it was constructed. The gallery page first functioned as a way to keep the public informed with the construction progress. Once the construction was completed it became a gallery to showcase the completed FountainView. The sales center contact form was brief so that potential buyers did not feel overwhelmed but it was effective in asking 4 importnat questions. How did you hear about us? Do you presently own? What type of unit you are interested in? What is your price range?